Below are the official 2017 Hockomock League Girls Soccer All Stars, selected by the coaches in the league. Attleboro, 1 @ Franklin, 0 – Final – Attleboro junior Will Halben scored the game-winner with 10 minutes to play, handing the Bombardiers their second win in three games, and three straight games with at least a point. After a scoreless first half, sophomore Michael Russo set Halben up for the late winner. Canton, 1 @ Foxboro, 1 – Final – Click here for a recap and photo gallery of this game. King Philip, 0 @ Mansfield, 1 – Final – In a battle of two heavyweights, Mansfield edged King Philip to stay within one point of Oliver Ames in the hunt for the Kelley-Rex title. Senior Nick Wisnieski headed in a corner kick from Luke Savoie in the 56th minute for the lone tally. Nick Ferraz made five saves in net for Hornets. North Attleboro, 3 @ Milford, 2 – Final – North Attleboro scored a pair of goals in the second half and held off a late push from the hosts to clinch its first-ever Davenport title, and first league title since 2007. Big Red took the lead in the 12th minute as Ryan Pasquel’s service was flicked by Gabe Pinhancos and then headed in by Zach Matracia. North made it 2-0 just eight minutes into the second half when Pinhancos converted at the near post on a service from Noah Barney. Milford cut the deficit to one 12 minutes later when Andre Oliveira got free and scored. But North responded five minutes later when Pinhancos volleyed in a header from Barney. Oliveira scored again on a rebound in the 76th minute. Taunton, 2 @ Oliver Ames, 7 – Final – Oliver Ames celebrated senior night with seven goals from seven different seniors. OA went up 1-0 before Taunton tied it; OA extended its lead to 4-1 before Taunton found the back of the net again and then the hosts scored three straight. Nathaniel Cardoza scored once and had three assists in the win. James Gillespie, Michael Nikiciuk, Jack Galas, Mason Galbato, Brandin Osborne and Nick Zwerle each scored once. Chris Lawrence added three assists and Matthew Alvarado had one helper. Stoughton, 2 @ Sharon, 3 – Final – Sharon overcame an early deficit and then broke a 2-2 game with a late goal to earn two points against Stoughton. Stoughton senior Tyler Melo scored on a free kick from distance but Sharon’s Tyler Goldstein nodded in a throw from Tyler Hippler in the 33rd minute to tie it. Andy Reyes-Jones put the Eagles ahead in the 36th minute but Stoughton’s Terry Lapomarede knotted the score in the 65th minute. Goldstein grabbed his second, and the game-winner, heading in a free kick from sophomore Michael Baur in the 70th minute. Franklin, 3 @ Attleboro, 0 – Final – Molly Duncan scored five minutes into the game off an Anna Balkus assist to put the Panthers ahead early. In the second half, Miranda Smith scored off a Duncan assist just two minutes after the restart and Calen Frongillo wrapped up the scoring from Emily Mastaj with 11 minutes to play. Franklin coach Tom Geysen said that all of the Panthers stepped up and “played really well,” despite the blustery conditions. Foxboro, 1 @ Canton, 4 – Final – Canton scored three times in the second half to break open a tie game and earn the two points. 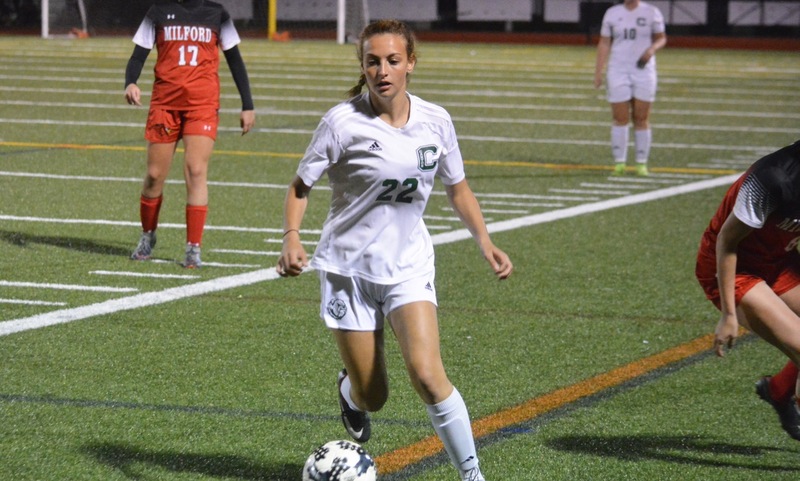 Olivia Rodman continued her standout freshman season with a hat trick for the Bulldogs and Sarah Connolly added a 30-yard free kick in the win. Foxboro’s goal was scored by Jordyn Collins and Foxboro coach Katie Stalcup said her team struggled to get into its typical passing game in the wind. Mansfield, 0 @ King Philip, 0 – Final – Click here for a recap and photo gallery of this game. Milford, 1 @ North Attleboro, 7 – Final North put in a stellar performance and Haley Guertin reached another career milestone in a big win. Guertin scored the game’s third goal for her 100th career point, making her only the second Rocketeers player to ever reach that mark. Haley Ferrin had a hat trick and Ashlyn Gaulin had a brace for North, while Rachel Labonte added the seventh. Gaulin added three assists, Leah Jette had two and Aine Mendonca and Guertin each had one apiece. Emma Noreck picked up the win in goal and North coach Bill Wallace said that Britta MacDonald and Brie Wescott “played inspired soccer.” Madeline Boyle scored the lone Milford goal. Oliver Ames, 4 @ Taunton, 0 – Final – Abigail Reardon and Anna Tempestoso each scored a pair of goals for OA in the win. Sophia Cox recorded a pair of assists and Emily Freeman had one. CANTON, Mass. – Just four minutes into Wednesday night’s game at World War II Veterans Memorial Field, Franklin opened the scoring, but instead of hanging its head and allowing the visiting Panthers to take control, Canton turned up the aggressiveness, pressured all over the pitch, and turned the game around. Riley Duserick, Elisa Diletizia, and Lilah Sullivan each recorded a goal and an assist, as Canton stormed back to dominate Franklin, winning 4-1 to get back above .500 for the season. Inside the opening four minutes, Franklin took the lead. Molly Duncan slid a through ball between the Canton defenders to find Miranda Smith running down the right channel and the senior forward lifted her shot over onrushing keeper Lindsey Barrett. Although the Panthers had the lead, it was Canton that was pushing the tempo and creating scoring chances. Duserick and Diletizia both had long shots saved by Franklin keeper Cat Robbins in the opening 15 minutes. The Bulldogs pressure created the breakthrough in the 23rd minute. Sullivan made a long run to the end line and sent in an inch-perfect cross over the outstretched arms of Robbins and to Diletizia unmarked in the middle of the six-yard-box. The freshman forward got a shin to the ball and knocked it in for the equalizer. Ten minutes later, Canton got the lead. Leianne Bruce won the ball in front of the Bulldogs’ bench and played it forward towards Diletizia, who cushioned a one-touch pass into the path of sophomore Morgan McCabe. Franklin right back Madison Stewart came all the way across to get a piece of the ball but it bounced right back to McCabe, who fired an unstoppable shot into the far corner. Franklin had one chance before halftime but a first-time shot from the edge of the box was sent over the bar by Carly Alston. Otherwise, the Canton defense looked impenetrable with center backs Sarah Connolly and Carly Hutchinsoncutting off every Franklin pass. The second half was completely dominated by the Bulldogs. Franklin center backs Grace Gallo and Brenna Atwood seemed to be under constant pressure from the speedy Canton attack. Diletizia had chance from the edge of the box saved by Robbins just one minute into the half. In the 47th minute, Duserick’s corner into the center of the box picked out Sullivan, who nodded home the third for the Bulldogs. The chances kept coming for Canton. Diletizia set up Sullivan for a first-time hit from the edge of the box but it went narrowly over the crossbar. A minute later, Juliana Agnitti burst forward from midfield and set up Diletizia, but the shot was saved. Lauren Fitzpatrick drove at the Franklin defense in the 56th minute and the ball was deflected by Atwood into the path of Julia Hamilton and she fired a shot that just missed the top corner. Canton (4-3-2, 4-3-2) will try to keep the momentum going on Friday with a trip to Taunton, while Franklin (6-3-1, 6-3-0) will look to bounce back when it hosts Stoughton. Franklin, 28 @ Milford, 10 – Final – Click here for a recap from the Game of the Week. 1st Quarter: (F) Jake Noviello 8-yard pass to Jack Nally, Matt Zucco XP Good; (M) Brendan White 4-yard rush, Sean Lehane XP good; (M) S. Lehane 20-yard field goal. 3rd Quarter: (F) J. Noviello 7-yard pass to Evan Wendell, M. Zucco XP good; (F) J. Noviello 6-yard pass to Ryan Driscoll, M. Zucco XP good. 4th Quarter: (F) Sean Hofferty 2-yard rush, M. Zucco XP good. 3rd Quarter: (D) Nate Ellis 62 yard rush, XP failed. 1st Quarter: (S) Scituate 82-yard pass, XP good; (C) Alec Ragusa 31-yard rush, Owen Lehane XP good. 2nd Quarter: (S) Scituate 31-yard field goal; (C) O. Lehane 31-yard field goal. 3rd Quarter: (C) Johnny Hagan 16-yard pass to Tony Harris, XP blocked. 4th Quarter: (S) Scituate 14-yard pass, XP good. King Philip, 16 @ Foxboro, 7 – Final – Click here for a recap of this game. 1st Quarter: (KP) Cole Baker 31-yard field goal. 2nd Quarter: (KP) Brendan Lydon 25-yard pass to Tom Madden, XP blocked. 3rd Quarter: (F) Devin Hassett 22-yard rush, Russell Neale XP good. 4th Quarter: (KP) Nick Kerr 5-yard rush, C. Baker XP good. 1st Quarter: (M) Danny DeGirolamo 52-yard rush, Mike DeBolt XP good. 2nd Quarter: (M) Damani Scott 24-yard pass to Hunter Ferreira, M. DeBolt XP good; (M) D. Scott 28-yard pass to Aidan Sacco, M. DeBolt XP good. 4th Quarter: (M) Joe Cox 10-yard rush, M. DeBolt XP good. 1st Quarter: (SL) Phil Lashley 37-yard rush, 2pt failed; (OA) Noah Fitzgerald 10 yard rush, 2pt failed. 2nd Quarter: (SL) Tanner Boyd 10 yard rush, 2pt failed. 3rd Quarter: (SL) T. Boyd 6 yard rush, 2pt good. 4th Quarter: (OA) Anthony Berksza 15 yard rush, 2pt failed; (SL) P. Lashley 4 yard rush, 2pt good. 2nd Quarter: (T) Noah Leonard 9 yard pass to Wesner Charles, John Teixeira XP good. 4th Quarter: (T) Prince Brown 48 yard interception return, J. Teixeira XP good. Attleboro, 2 @ King Philip, 3 – Final – Reigning Hockomock League MVP Tyler Mann netted a hat trick to lead the Warriors past Attleboro. 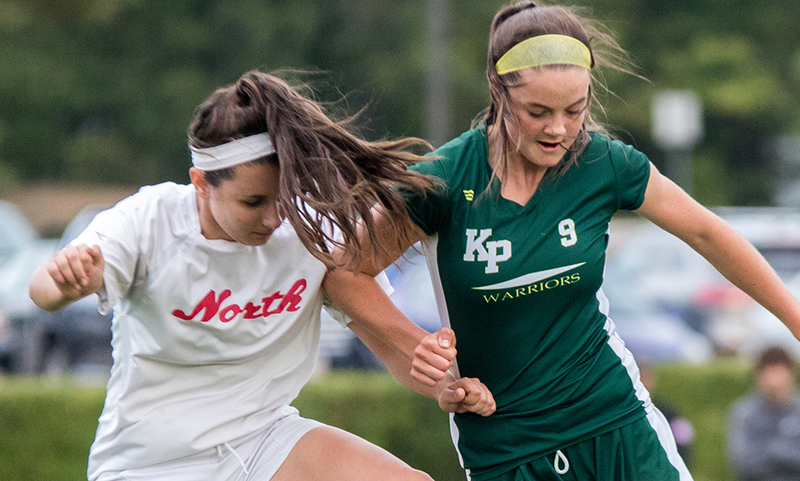 Attleboro opened up a 2-0 lead in the first 15 minutes but King Philip rallied to cut the deficit in half before the halftime break and netted two in the second half. Aidan Lancaster converted the opener on an assist from Will Halben in the fourth minute and Mike Russo doubled the lead on a feed from Devin Andre in the 15th minute. Mann opened his 2017 account in the 25th minute on an assist from Tony Bozza. Mann tied the game in the 52nd minute and then finished off a feed from Connor Mullins in the 67th minute for the winner. Canton, 1 @ North Attleboro, 1 – Final – Canton opened the scoring in the 29th minute when junior Paul Corcoran buried an assist from Griffin Roach to go up 1-0. But North Attleboro responded just a minute later, tying the game when Jeff Gale hammered home a rebound off a shot from Gabe Pinhancos. Foxboro, 1 @ Sharon, 0 – Final – Foxboro scored the game-winning goal in the final minutes of the game to earn a key division win on the road. Junior Shane VandenBoom finished off a cross from Cam Cass for the winner. Franklin, 0 @ Oliver Ames, 2 – Final – Oliver Ames senior Brandin Osborne continued his strong start to the season, scoring a pair of second half goals to lift the Tigers over Franklin. After a scoreless first half, Osborne scored twice, assited by Cam Vella and Nathaniel Cardoza. Jack Carroll earned his third shutout of the season and OAHS head coach John Barata said Vella, Mason Galbato, Colin Evin, Matt Campell and Chris Lawrence played great in the back for the Tigers. Taunton, 1 @ Mansfield, 5 – Final – Mansfield built a 5-0 lead in just over a half hour of play in a big win over visiting Taunton. John Cooney opened the scoring in the 5th minute, converting a throw in from Sam Hyland. Junior Luke Savoie buried a shot from distance to double the score, and two minutes later, Sean Lanzillo nodded home another Hyland throw. Austin Ricker made it 4-0 on a feed from Jake Tuleja and Connor Eames netted his first career goal off an assist from Colin Caridi. Taunton’s Jake DeAndrade picked the upper corner from distance in the 32nd minute to get the Tigers on the board. Stoughton, 1 @ Milford, 2 – Final – Milford scored once in each half to build a 2-0 lead and held off a late Stoughton push to earn the two points. Wallison Tavares opened the scoring for the Hawks, heading home a corner from sophomore Jordan Borges to put Milford up 1-0. Anthony Salvador doubled the lead in the second half on an assist from Joey Madden. MHS head coach Brian Edwards said Brayan Traya played well in the midfield for the Hawks. King Philip, 4 @ Attleboro, 1 – Final – KP scored two goals in the second half to break open a one-goal game at the break. Attleboro trailed 2-1 at the half with a goal by freshman Isabella Salviati and head coach Steve Santos said the Bombardiers came out strong to start the second half, but KP was able to get the third goal and extend its perfect start to the season. North Attleboro, 3 @ Canton, 3 – Final – The Bulldogs rallied from a 3-1 deficit to get the draw. 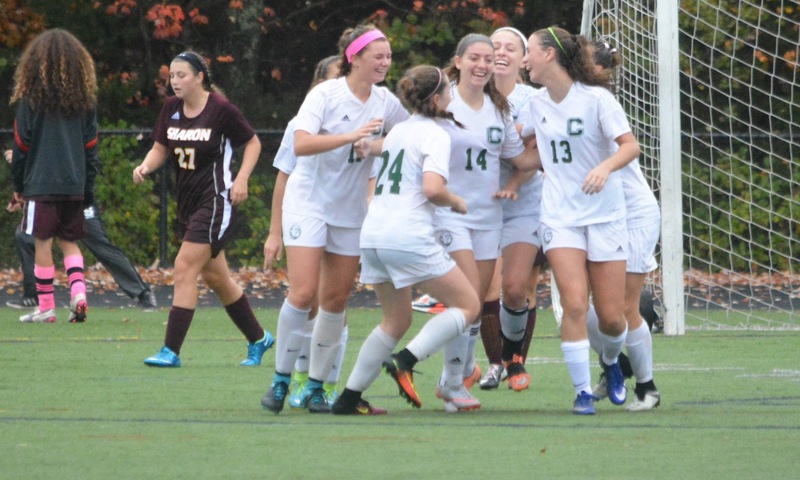 Morgan McCabe scored off an Olivia Rodman cross to cut the lead to one and Sarah Connolly finished off a corner from Sarah Collins with about four minutes to play to earn Canton a point. Canton’s first goal was by Collins from another Rodman cross. North goals were by Leah Jette, Aine Mendonca, and Kayla Pasquel. Sharon, 1 @ Foxboro, 4 – Final – The Warriors earned their first win of the season and the first win for head coach Katie Stalcup. Foxboro got goals from Jordyn Collins, Lizzy Davis, Shaina Abbott and Grace Ferguson to bring home its first two points. Ally Filipkowski got the lone goal for the Eagles and Lydia Chase had a great game, according to Sharon coach Brad Furnival, making more than a dozen saves in the loss. Oliver Ames, 1 @ Franklin, 2 – Final – Molly Duncan scored the winner with a long-range shot in the final eight minutes of the game to earn the win for the Panthers. Abby Reardon gave OA the lead seven minutes after halftime, but Anna Balkus tied it for Franklin six minutes later. Regan Benton made seven saves for the Tigers and Cat Robbins made 10 for the Panthers. Mansfield, 4 @ Taunton, 0 – Final – Emily Vigeant scored a pair of goals, as the Hornets continued their unbeaten start to the season. Sydney Mulkern and Amanda Mangano also scored for Mansfield. Milford, 3 @ Stoughton, 1 – Final – Cassie Probert, Hannah Martin, Maddie Boyle each scored goals for Milford, which has won back-to-back games. Freshman Mackenzie Manning scored the lone goal for the Black Knights. Oliver Ames, 7 vs. West Bridgewater, 1 – Final – West Bridgewater scored first but Oliver Ames scored seven straight goals to rout the visitors. Liz Nuss and Emily Han each scored two goals while Meaghan Rockey, Maura Kiernan and Brenna Woods each found the back of the net once. Sarah Stevens had three assists while Kayla Lozzi, Rockey and Nuss each had one helper. Stoughton, 7 vs. Brockton, 0 – Final – Allie Howe and Kamryn Oliveira each netted a pair of goals for the Black Knights. Lisa Ramanauskas, Jordan Lyons and Alanna McCormick each scored once in Stoughton’s win. Attleboro, 0 @ King Philip, 3 – Final – King Philip defended home court with a dominant sweep (25-17, 25-8, 25-4) over the visiting Bombardiers. Kat Kmetz rattled off 21 service points for KP, including two aces. Sydney Phillips (12 kills), Michaela Palumbo (six kills) and Grace Ely (three kills) paced the Warriors’ offense. Canton, 1 @ North Attleboro, 3 – Final – North Attleboro notched a key division win over visiting Canton, 25-14, 25-12, 23-25, 25-8. Kezie De La Cruz (two aces) and Amelia Murphy (five aces) each had 14 kills in the win for the Rocketeers while Leah Marceau finished with 26 assists. CHS coach Pat Cawley said Nicole Brown had a great night for the Bulldogs, finishing with 21 assists while Hannah Jerrier finished with 13 kills. Franklin, 3 @ Oliver Ames, 0 – Final – Trailing 9-17 in the third set, Franklin’s Lizzie Boynton went on a 10 point serving run, including four aces, to put Franklin ahead and help the Panthers finish the sweep. During the Panthers’ comeback, Emma Clifford played strong defense and added two kills. Ellie Wisniewski finished with nine kills and an ace. Taunton, 0 @ Mansfield, 3 – Final – Mansfield bounced back from its first loss of the season with a 25-12, 25-19, 25-12 sweep of visiting Taunton. Julia Harrison paced the Hornets’ offense with 13 kills and 13 service points. Meg Hill added 12 kills and Olivia McGrath finished with 17 service points. Stoughton, 3 @ Milford, 0 – Final – Stoughton notched its fifth straight win to open the season, sweeping Milford 25-11, 25-18, 25-13. SHS junior Molly Turner controlled the offense with 21 service points and 10 assists while senior Val Whalen had a strong game with 15 kills, 12 digs and eight service points. Milford head coach Dan Seaver said Emily Piergustavo and Julia Riordan played well from the setting spot and Sydney Sutton had a good day in the back row. Attleboro, 187 @ King Philip, 154 – Final – King Philip’s Danny McLoughlin shot a match medalist round of 36 to lead the Warriors to a win over Attleboro. Taunton, 174 @ North Attleboro, 154 – Final – North Attleboro’s Dylan Kane carded a one-over-par round of 36 to pace the Rocketeers at the middle course at Heather Hill Country Club. Jillian Barend (38) and Matt Wanless (39) also carded rounds under 40 for Big Red. MILFORD, Mass. – For the first 30 minutes of the D2 South Semifinal, 15th-seeded Canton was not only the better side, but the Bulldogs were dominating sixth-seeded Medfield and held a 3-1 lead. But a late surge from the Warriors resulted in two goals in the final three minutes to bring the teams level just before halftime. Medfield used that momentum — and the advantage of the wind — to go on and score four goals in the second half and come away with a 7-3 victory of the Bulldogs. From the opening minute, Canton seized control of the play,. 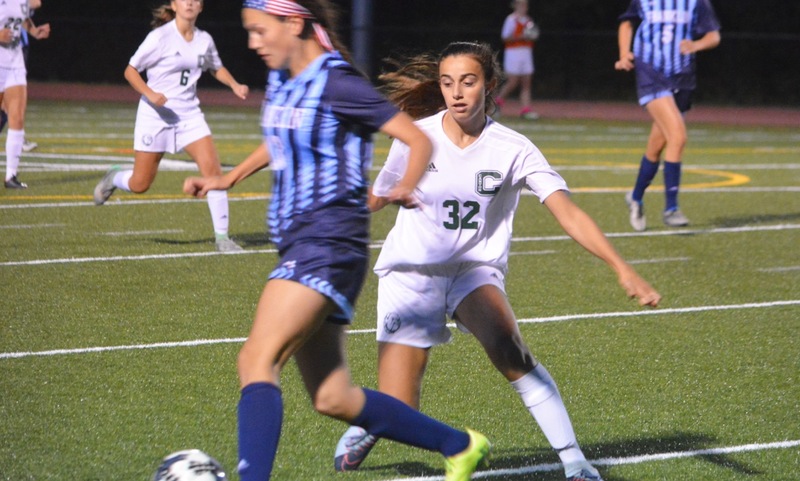 Junior Sarah Connolly won possession just over half, dribbled her way through the Medfield defense and unleashed a shot from atop the area that forced a save. Canton finally broke through in the 18th minute when Hannah Link sent a pinpoint through ball that Tessa Cudmore ran onto. Cudmore muscled her way past one defender and held off another as her shot from just inside the area found the far post for a 1-0 lead. Four minutes later, the Bulldogs doubled the lead. Riley Duserick whipped in a curling corner kick that forced Medfield keeper Sarah Graham into a save but the rebound fell right to Julia Hamilton, who one-timed it in from in close. Medfield applied pressure after a timeout, first with Kathryn Doody coming off her line to thwart a break from Alanna Cooney. But a minute after the save, Cooney gained some space on the right wing and ripped a shot to the far post to cut the deficit in half at 2-1. Canton was quick to respond, with Duserick nearly scoring an olimpico off a corner but the linesman deemed it didn’t cross the line. In the 27th minute, the ball popped into the attacking area and Cudmore played it perfectly, shielding off a defender to get some space before placing it into the corner for a commanding 3-1 lead. But in the 37th minute, Annie Phipps used a turn just outside the area to gain a bit of space and fired top shelf to bring the Warriors within one. Two minutes later, Phipps centered a cross to Taylor Sherman, who got a touch past Doody as she charged out, and slid the ball into the net to make it 3-3. “The momentum swung in their favor completely and it hammered us,” Canton head coach Kate Howarth said. “I think it’s a completely different game if we go into halftime with a 3-1 lead. It took the wind out of our sails for sure. We had the momentum for the whole first half until the last 10 minutes and we just crumbled. Medfield scored the game-winner in the 55th minute as a long throw eluded Canton’s defense and Sherman raced onto it. The break forced Canton’s defense to commit and Sherman centered to Cooney in the middle for an open shot and goal. The Warriors made it 5-3 when a long throw found Maggie McCarthy at the near post for a flick to the far post. 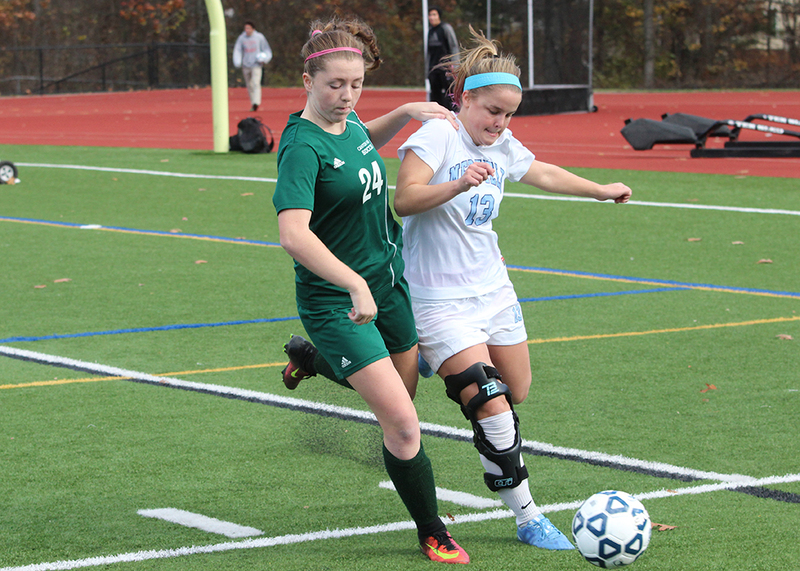 Medfield added a pair of goals in the final 10 minutes as the Bulldogs pushed numbers forward. In total, eight of the 10 goals scored in the game came from the team playing with the wind at its back. “The wind affected the game a lot,” Howarth said. “It’s not just a breeze, it’s significant. It can help take the ball when you have it and it can kill you when you’re against it. Canton girls soccer finishes the season at 10-8-2. The Bulldogs, who were seeded 15th in the D2 South Sectional, knocked off #2 Greater New Bedford and #10 Milton in their tournament run. 1st Quarter: (M) Anthony DeGirolamo 33 yard pass to Mike Shannon, 2pt failed; (M) Nick Graham 22 yard rush, Diogo DeSousa XP good. 2nd Quarter: (M) A. DeGirolamo 12 yard rush, D. DeSousa XP good; (M) Joe Cox 49 yard rush, D. DeSousa XP good; (M) A. DeGirolamo 14 yard pass to Aidan Sacco, D. DeSousa XP good. 3rd Quarter: (OA) Liston Funai 1 yard rush, Anthony Berksza 2pt rush; (M) A. Sacco 12 yard rush, D. DeSousa XP good. King Philip, 4 @ Taunton, 0 – Final – King Philip senior Cam Mullins scored the game-winning goal in the first half on a penalty kick (drawn by Colby Koch). Anthony Bozza and Cam Koch scored second half goals, both on assists from Tyler Mann and John Cullen capped the scoring on a feed from Nils van den Boogaard. 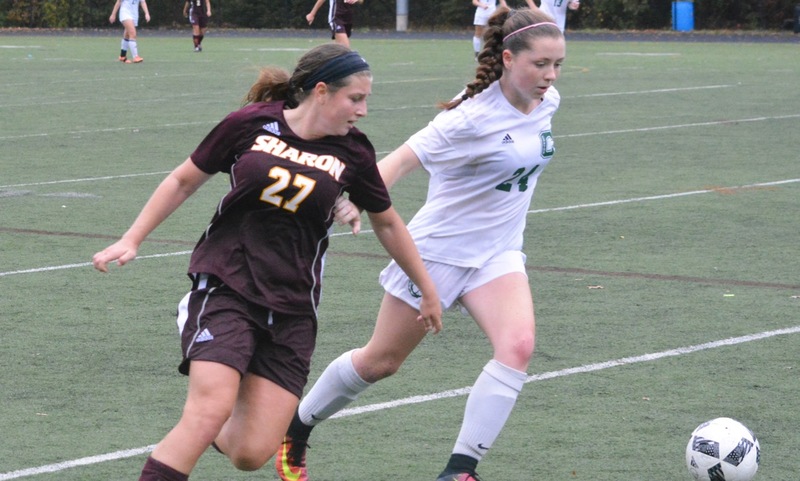 Sharon, 0 @ Canton, 2 – Final – Sarah Connolly scored directly off a corner after a deflection to put Canton ahead in the first half. Catherine Leonetti, off a pass from Tessa Cudmore, doubled Canton’s lead with a strike off the crossbar and in.